Astronauts Terry W. Virts Jr. (left) and Stephen K. Robinson communicate with the Expedition 14 astronauts on docking day for the International Space Station and the space shuttle Discovery during the STS-116 mission in December 2006. NASA haschosen a substitute spacecraft communicator to replace astronaut LisaNowak during the upcoming STS-117shuttle flight to launch next month, mission managers said Thursday. CathyKoerner, leadshuttle flight director for NASA's STS-117mission aboard the Atlantisorbiter, said Thursday that astronaut Terry Virts will take Nowak'sposition as lead spacecraft communicator -- or Capcom -- during the upcomingconstruction mission to the International SpaceStation (ISS). NASA placedNowak on a 30-dayleave last week after she was charged withattempted murder, attempted kidnapping and other counts stemming from a confrontationwith a woman whom police said the astronaut believed to be a romantic rival forthe affections of a space shuttle pilot. 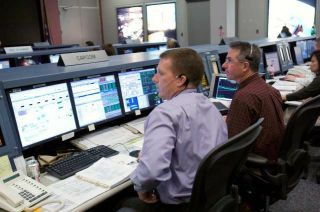 "Terry wasmy Capcom during [STS-115],and so he's familiar not only to me but to this mission and its content andalso to the rest of the flight control team," Koerner said of Virts, referringto NASA's September2006 shuttle mission in which astronauts performed similar tasks to thoseset for STS-117. Virts alsoserved as a spacecraft communicator for one of three ISS Mission Control shiftsduring NASA's STS-116shuttle mission in December 2006. Capcomastronauts serve as the voice of Mission Control to astronauts in orbit, withseparate positions in place for both the space shuttle and the ISS. Nowak wastraining to serve as lead STS-117 shuttle Capcom before NASA placed her onleave. Led byveteran shuttle flyer RickSturckow, Atlantis' six-astronautcrew is scheduled to launch on March 15 at 6:43 a.m. EDT (1043 GMT). During theplanned 11-daymission, Sturckow and his crew plan to stage three spacewalks to installtwo massive starboard-side segments of the space station's main truss, unfurl apair of new solar arrays and stow an older solar wing extending form theoutpost's mast-likePort 6 truss. "I'm quiteconfident there will be no impact to our mission," Sturckow said of thelast-minute Capcom swap. Sturkowadded that he and his crew trained with Virts on specific STS-117 activitiesearlier this week, and have performed generic flight simulations with him inthe past. "The crewand the team in mission control has been focusing on the preparation of thismission," Koerner said.